This FourTwenty Cane Bong is an exciting piece of glass art that will offer you a super-duper hit! 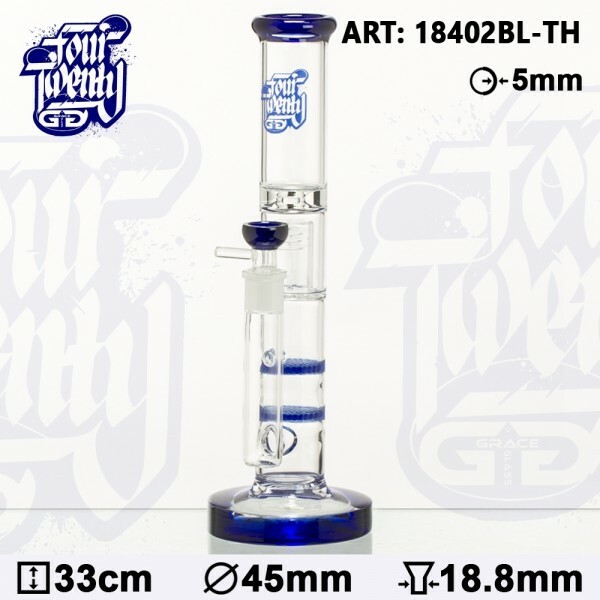 It comes with some blue accents upon a sturdy heat resistant borosilicate glass, formed in the shape of a flat base tube. Two succesive series of a blue coloured honeycomb will filter your smoke and a splashguard in slits will prevent water from splashing into your mouth. What' s more, a tornado disk will furthermore break up your smoke. The build-in diffuser ends up in a sure ground of 18.8mm diameter, accompanied by a blue bowl for placing your herb or tobacco. The bowl has a handle that makes it easier to use as long as you can lift it up and clean it at your convenience. With the FourTwenty logo featuring at the top of the tube, the whole set-up ends up in a cosy mouthpiece ring.